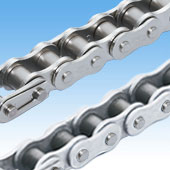 The plates and rollers of this Lambda Chain are surface-treated to increase corrosion resistance. Plates and rollers have a special nickel plating for light corrosion resistance. Plates have a triple layer surface treatment, and rollers are specially coated, for increased corrosion resistance. NEP Series pins are nickel plated and the bushes are made of a sintered metal. NEP Series is made to order, contact a Tsubaki representative for more information.